Yesterday, I had the chance to revisit my old hometown, Las Pinas. I now live in Molino, Bacoor Cavite, literally a stone’s throw away or should I say a river’s throw away from neighboring Las Pinas but it has been years since I last explored the place and took notice of the many changes that happened here. I grew up in Baranggay Manuyo, the first district of Las Pinas that would welcome you if you are coming from Paranaque. It is the home of the famous Bamboo Organ Church. I had a memorable childhood in Las Pinas. My lolo used to take us to the “beach” near Villa Manila every morning when I was a child. This was actually a portion of Manila Bay before it was reclaimed and made into Coastal Road. I remember that we used to gather clams and swim there. I also have a good recollection of afternoons spent playing at our family’s Irasan (salt bed) which had been the primary source of living of my dad’s family. The river back then was healthy and teeming with aquatic life. My family even owned a small fishpond too where fresh supply of sugpo and tilapia can be harvested. Everything changed though when development came and they started reclaiming the “beach” to construct Coastal Road. Flooding grew worst in Manuyo. Businesses started cropping up everywhere and people started setting up homes there as well. Uncontrolled dumping of garbage in the river eventually caused it to die and down came with it our Irasan and our fishpond. As much as we hate leaving the place that we love so much, we knew that moving to a less crowded place like Molino was inevitable. Summer of 1995, after graduating high school from St. Joseph’s Academy, we made the move to Cavite but I guess you could say that I left my heart in Las Pinas. Six years after we left the place, I came back to march and meet my groom at the altar of St. Joseph’s Church while the sweet melody of the Bamboo Organ was playing in the background. Yes, I got married in the church where I was baptized and confirmed. In my hometown that I love so much. But then life happened. Though I can say that I never totally forgot about Las Pinas, it was easy to take for granted this place especially when you need not pass the route leading to Old Town Las Pinas where I grew up and just conveniently head straight to Coastal Road to go to Manila or to Daang Hari and SLEX to go to Makati. I was aware of the developments and changes happening in the city but I wasn’t too keen on learning more about it until the other day. In line with The Villar Foundation’s 20th Anniversary, I was invited by the group of Mrs. Cynthia Villar to visit the sites of the different Green Social Enterprises of the foundation as well as learn more about the different Solid Waste Management Practices that the city has been conducting. The Villar Foundation’s Social Enterprises aimed to: (a) reduce proverty, (b) manage the city’s garbage problem, and (c) preserve and conserve the community’s natural resources. 10 years after, the historical Las Pinas-Zapote River whom others considered dead and beyond hope, lives again. Through the concerted efforts of concerned residents and through viable engineering solutions, the clean up was completed. Up until now the residents continue to live up to the challenge of preserving and conserving the river long after after the clean up ended for they have successfully shed the uncaring attitude and have taken it upon themselves to look after this community resource. Just like how the river served as the backbone of early communities before, the birth of The Villar Foundation’s Green Social Enterprises and Solid Waste Management can also be traced back to their efforts to revive and sustain the Las Pinas-Zapote River while at the same time providing livelihood assistance to the marginally poor sectors in their district. Engr. Dexter Gonzales shared that, “Nung nililinis namin yung ilog natuklasan namin na isa sa duming naipon sa baba ng ilog ay ito mga coconut husks na ito.” Coconut fruit has been popular among city dwellers and these accounts for the pile of coconut husks that inevitably found its way to the river bed and later became garbage that clogged the river. At around that time also, soil erosion along the river banks has alarmed The Villar Foundation. Mrs. Cynthia Villar fortunately learned about former dean of Bicol University, Dr. Justino Arboleda’s work on coco nets, a low cost biodegradable netting material that arrest soil erosion. 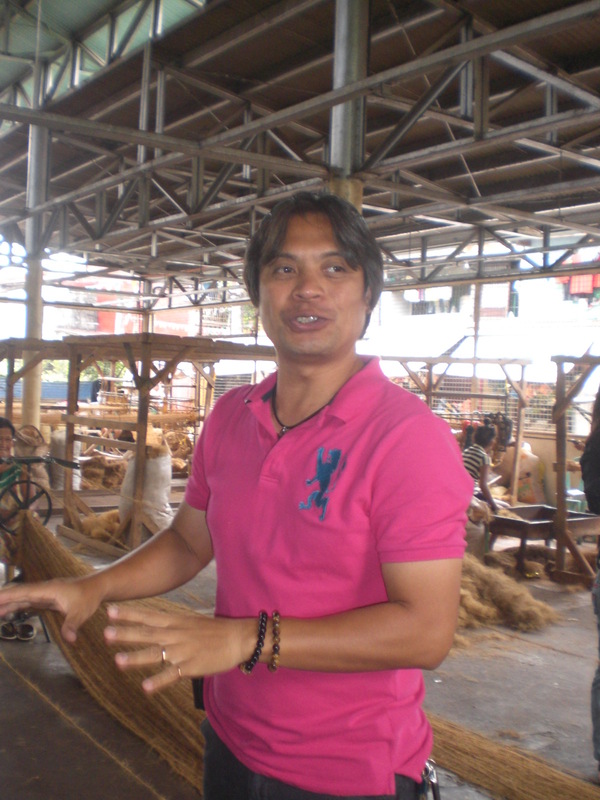 After seeking him out and getting his commitment to share his knowledge, The Villar Foundation set the motion for the establishment of The Las Pinas Coco Coir Enterprise. Instead of utilizing it only as a means to deload the river from coco nut husks garbage and to build coco nets that would address the problem of soil erosion in the river, they decided to make it a livelihood project as well. They made it a venue where underpriviledged families in the community can have the opportunity to earn money. 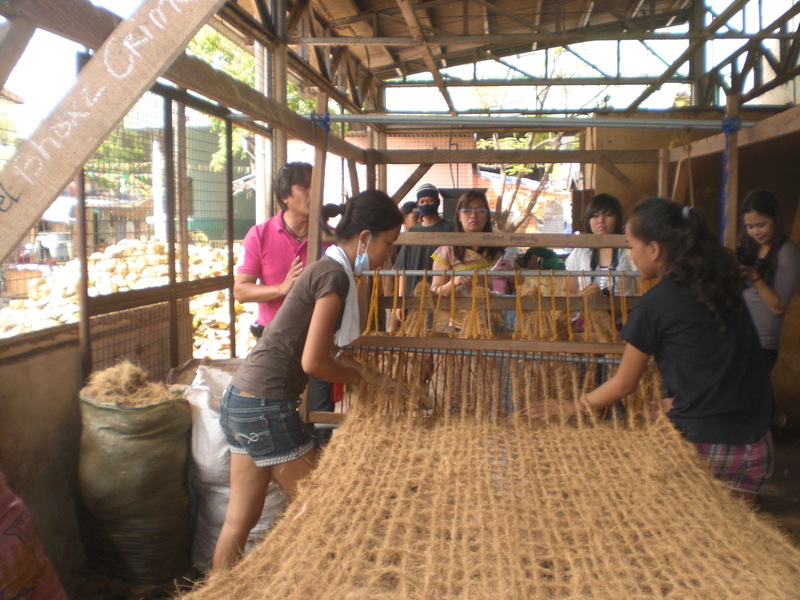 The Villar Foundation trained families in the branggay with the skills necessary to twine and weave coco nets. 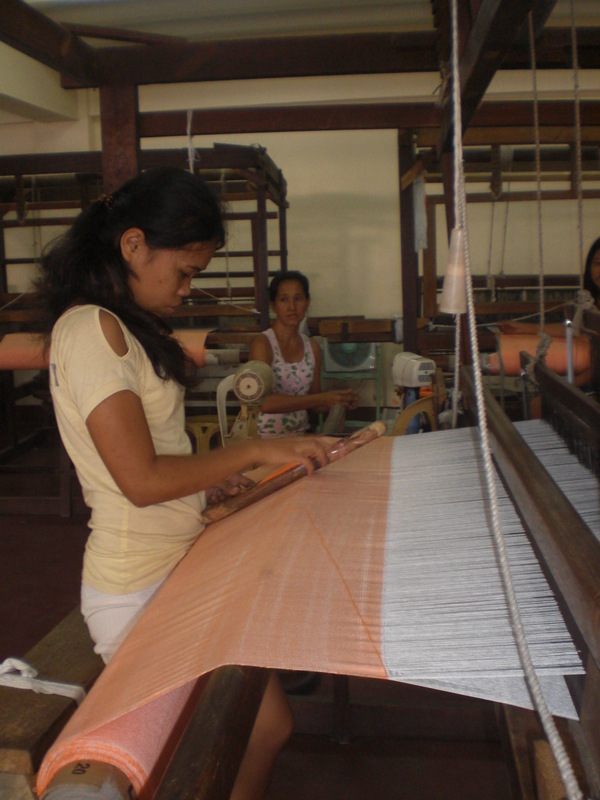 To date, there is one Coconet Weaving Center in each of Las Pinas’ 20 baranggays where housewives and their family members can go to and weave nets. 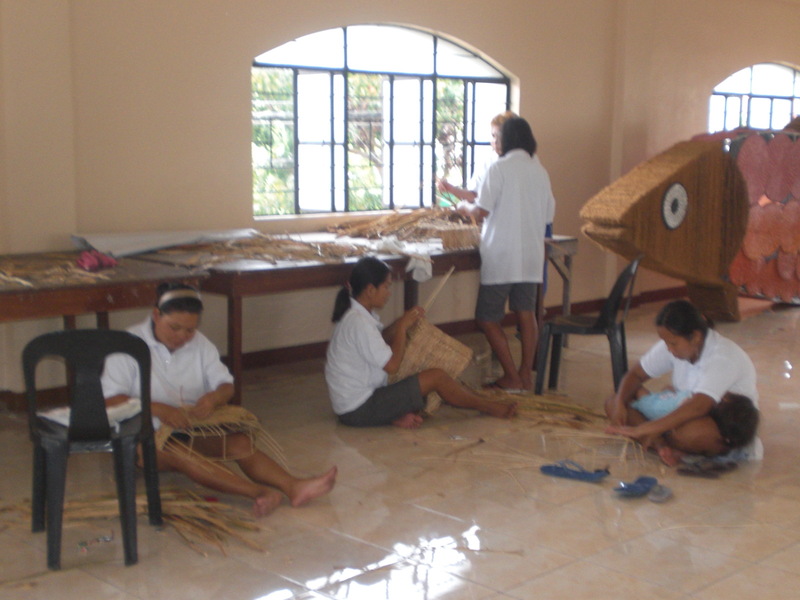 The Coconet Weaving Centers are strategically placed in the heart of each baranggay so mothers who want to work can simply walk going there anytime it is convenient for them. 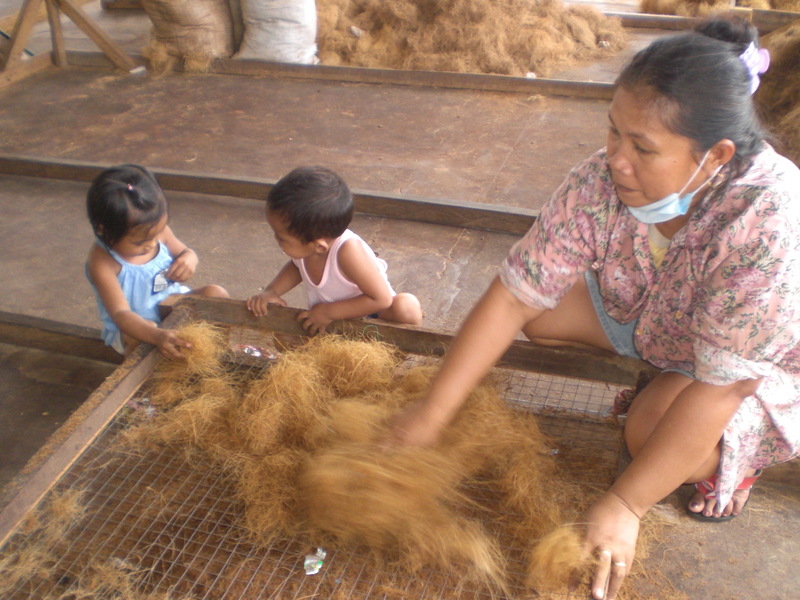 A family can earn a minimum of 3, 300 pesos per week by twining and weaving coconets alone. When we were there, several mothers with their children in tow were working. I asked one mother how she felt about working there and she shared that, “Gusto ko po dito kasi malapit at tsaka di ko na poproblemahin yung magaaalaga sa anak ko kasi open naman sila dito sa mga bata, puede din sila tumulong dito.” The coco nets are preventive measures against soil erosion. They are used to hold the soil down. Plants are grown on the eyelet spaces to establish a root system that would hold the soil further. 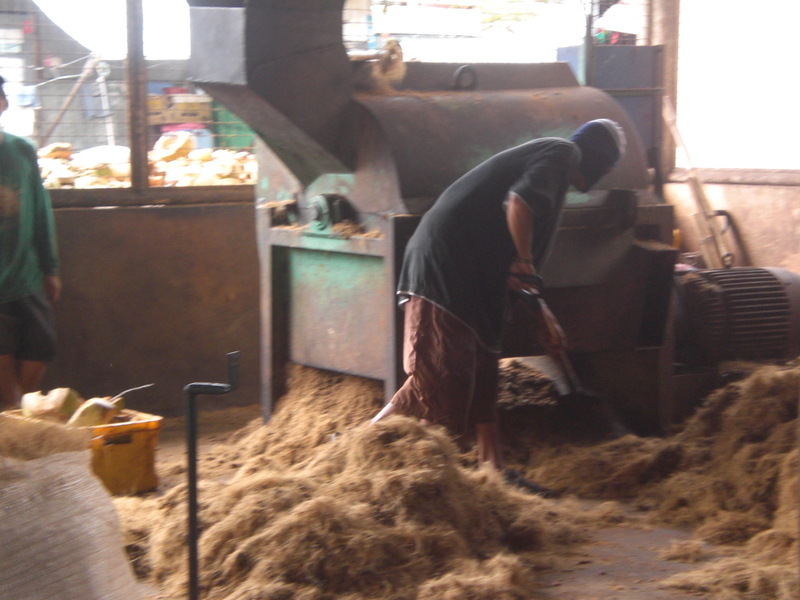 The Villar Foundation’s Coconut Coir and Peat Enterprise has successfully woven the perfect economic and ecological solution that would provide livelihood opportunities to housewives and their families. At the same time, it presents the perfect rehabilitation solution that would sustain the river in the years to come. 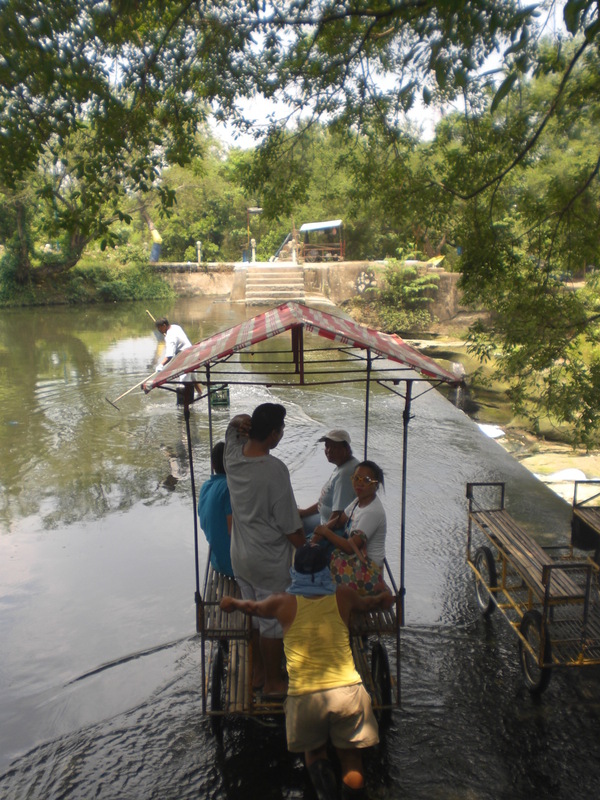 One of the problems that the group encountered while cleaning up the river was the presence of water hyacinths there. These have impeded the clean up efforts as they have prevented barges from moving and collecting trash easily. Though a beautiful sight, these water hyacinths, which are commonly known as water lilies, have long been considered a pest. Since they are virtually indestructible, they trapped garbage and clogged the river. They also served as breeding places for the dreaded dengue mosquitoes. 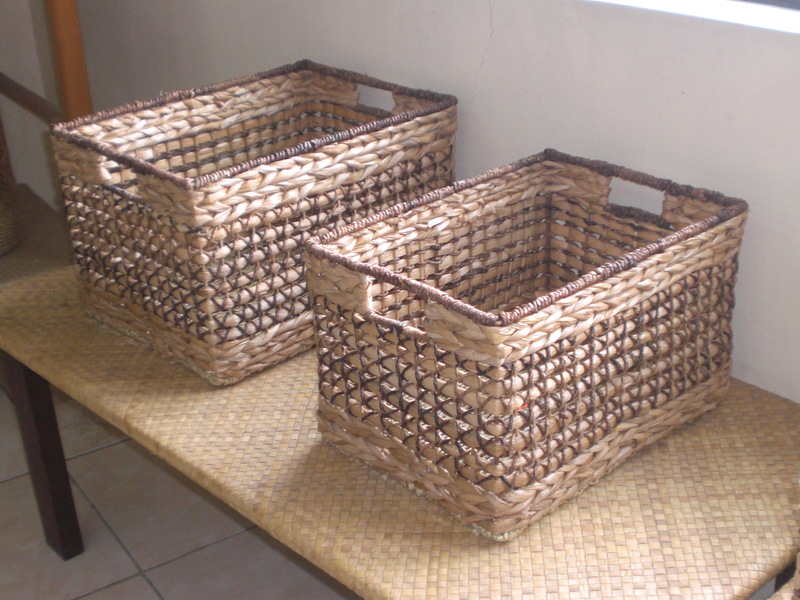 The idea of using water hyacinths to make baskets and other things came from Mrs. Ophelia So, an exporter of hand woven baskets. 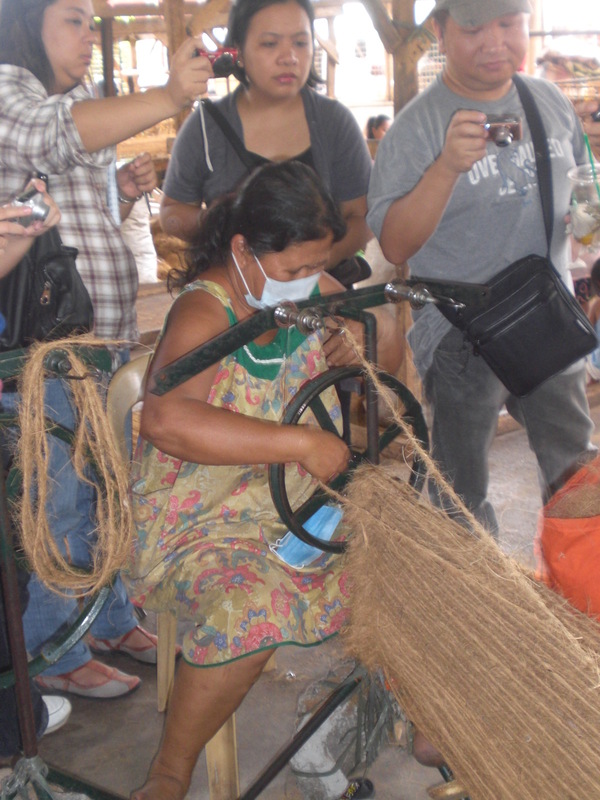 When Mrs. Cynthia Villar learned that there is a market for hand woven baskets made of water hyacinth, she set out to form a skills training program in weaving dried water hyacinth stalks for women who live near the center and didn’t have a steady source of income. 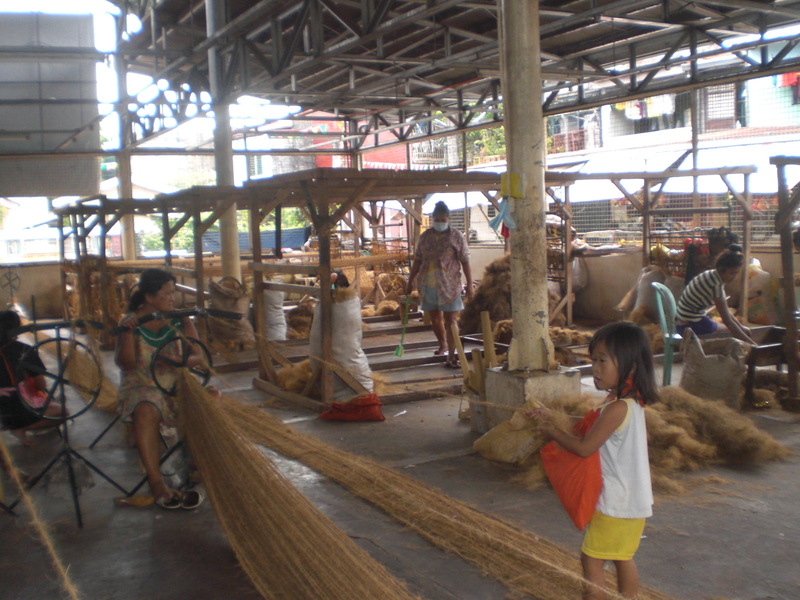 Townfolks who concentrated their efforts in harvesting and drying the water hyacinths to supply the Las Pinas Basket Weaving Center were also paid for their efforts. 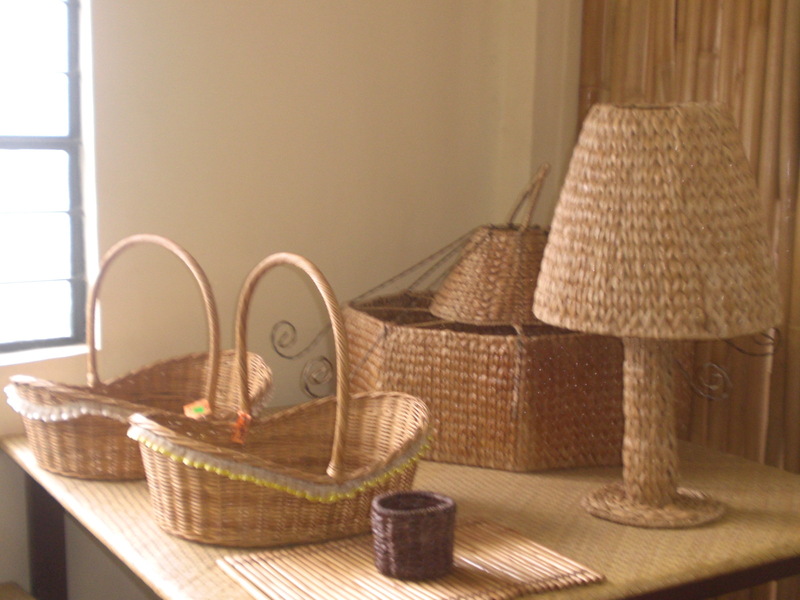 To date the women and men who chose to stay in the program cite water hyacinth weaving as their families’ main source of income. 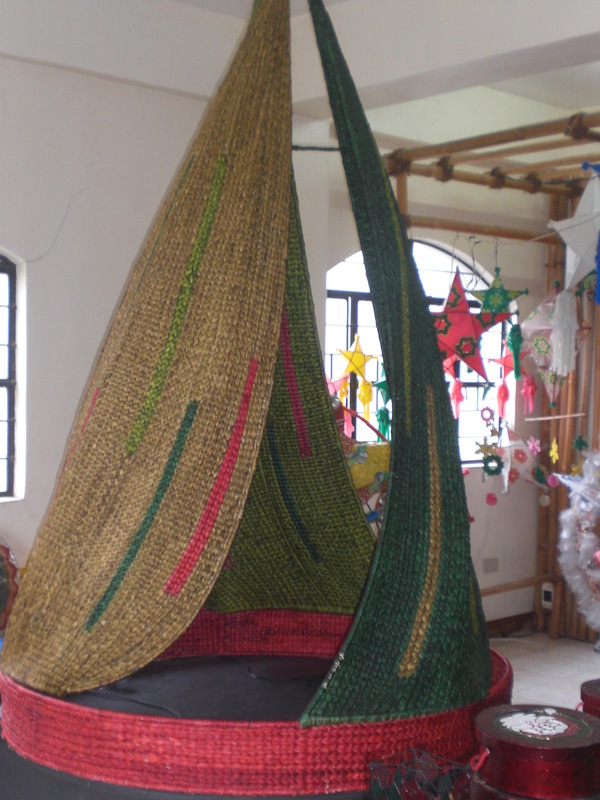 Though there are no water hyacinth to harvest anymore since the river has long been cleared out of these pests, The Villar Foundation’s Water Hyacinth Weaving Enterprise still sourced out water hyacinths from the nearby Laguna Lake to sustain this thriving livelihood. This has manged to turn what once was considered an environmental pest into a medium where housewives’ excellent artistry and craftsmanship and love for their community resources come together. Through the Handloom Blanket Weaving Enterprises, The Villar Foudation has not only given these women a chance to earn money but the satisfaction in knowing that they can be productive members of the community as well. It has managed to uplift the quality of life of these women by arming them with the necessary skills needed to succeed in this enterprise. These women clearly are hanging on a thread where their futures seem to be pretty much laid down like a blanket of big possibilities. They have indeed proven that with their perseverance and diligence, they can weave a bright future for their families. As part of their desire to come up with sustainable solution to the mounting garbage problem of Las Pinas, Mrs. Cynthia Villar through The Villar Foundation during her term as Congresswoman of Las Pinas, enjoined households to segregate their trash properly. Undaunted by the strong resistance from the people, she continued to mobilize this project with the help of priests, baranggay captains, and other concerned groups who set out to educate the residents of their moral and civic responsibilities to the environment. House to house education campaigns by different association were done. 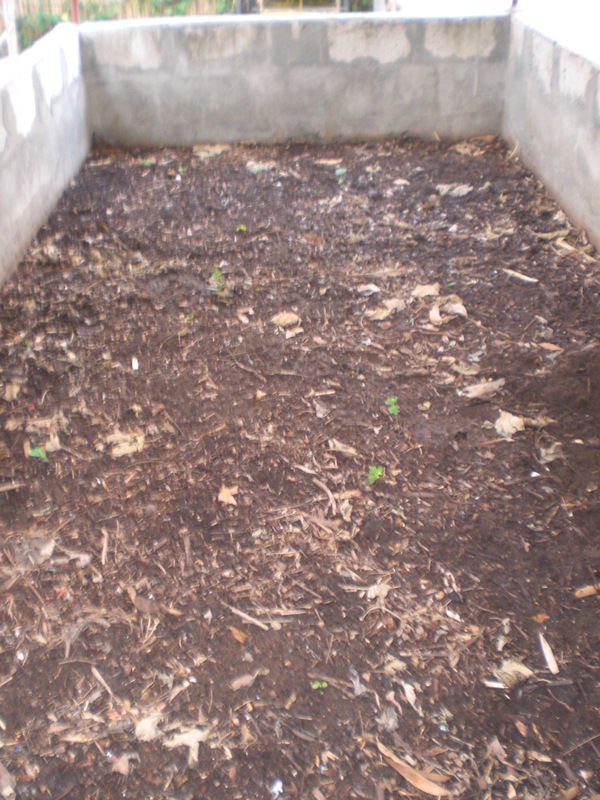 The plan was to turn the biodegradable into compost. 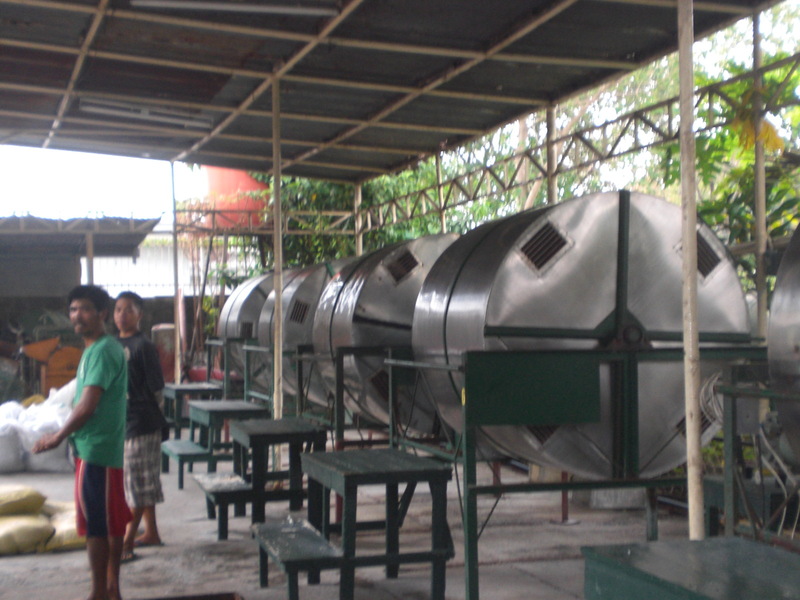 Bio-digesters were placed in each barangay. 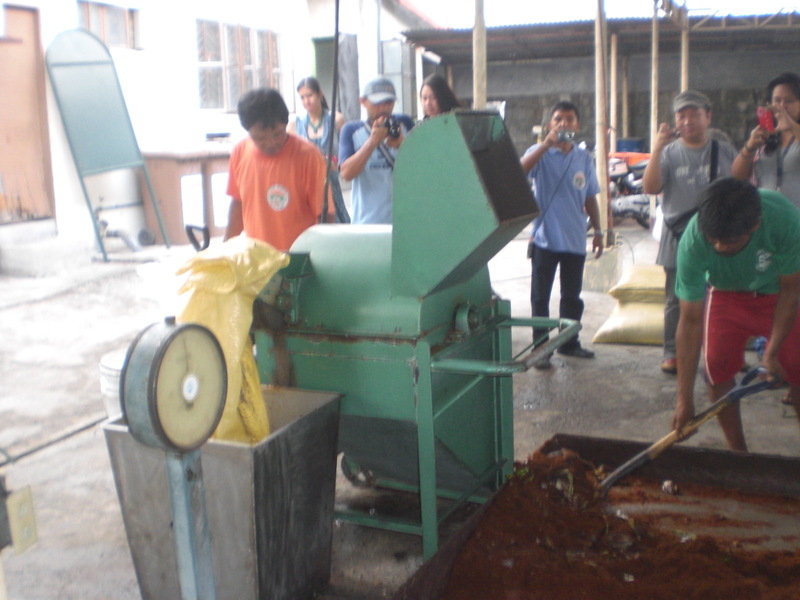 To provide livelihood assistance, each baranggay hired “bio-men” who will collect kitchen wastes from Monday to Saturday, starting at 7 o’clock in the morning. 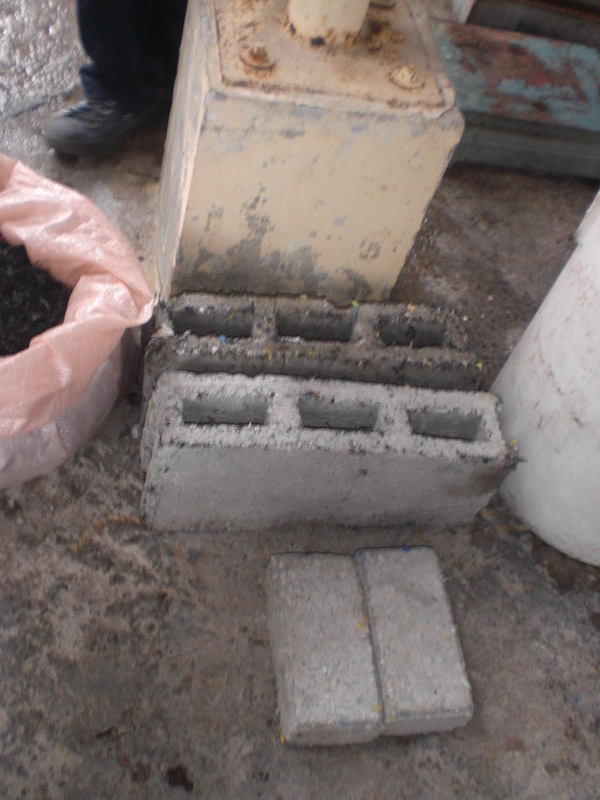 The wet garbage collected are then brought to the Bio-digester where they are processed and mixed with coco peat (coconut dust gathered from the coconut husk) and trichoderma enzymes to create organic fertilizers that condition the soil to become healthy. Part of the compost generated is used for the regreening and tree-planting programs in Las Pinas while the rest are bought by farmers from far provinces like Nueva Ecija to produce organic vegetables. 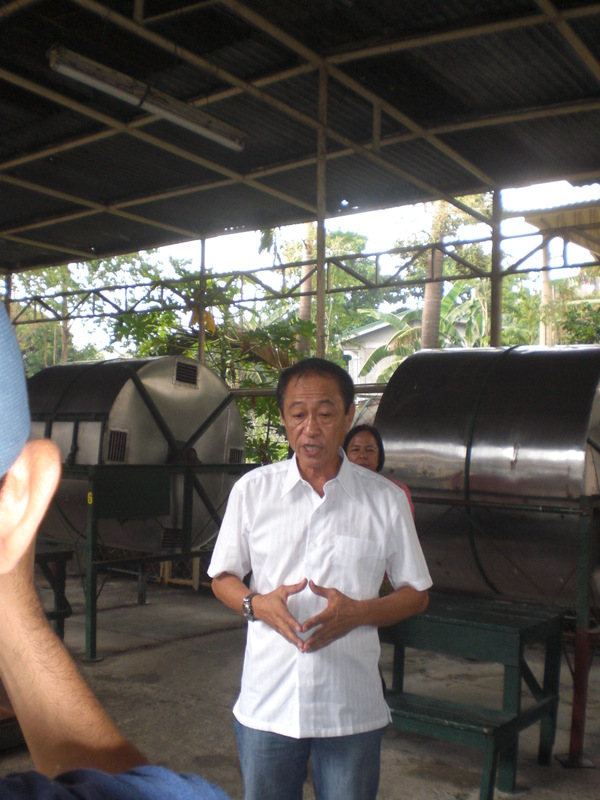 The income derived from the sale of the composts are awarded to the barangay or subdivision housing association to support their environmental activities. 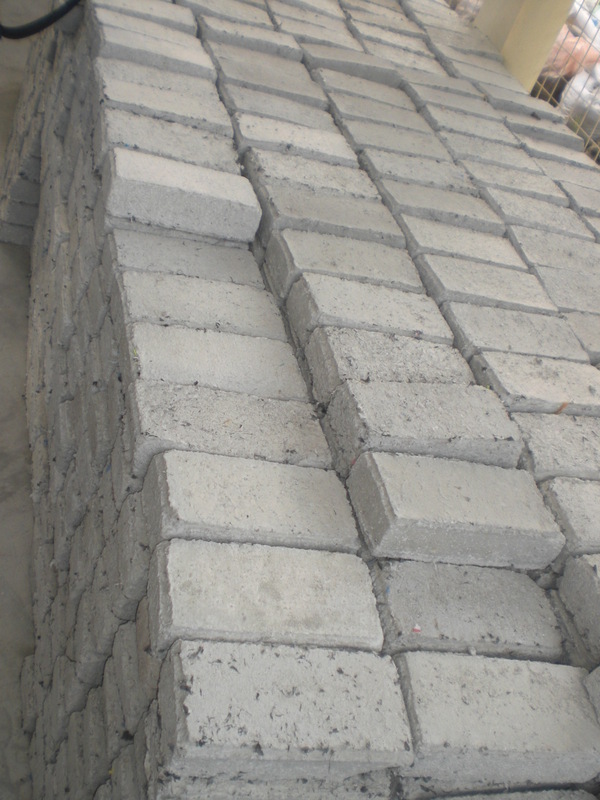 Residual wastes such as those that cannot be recycled, reused or composted are manufactured and turned into construction materials like hollow blocks and pavers that the city government itself uses to beautify the whole of Las Pinas. 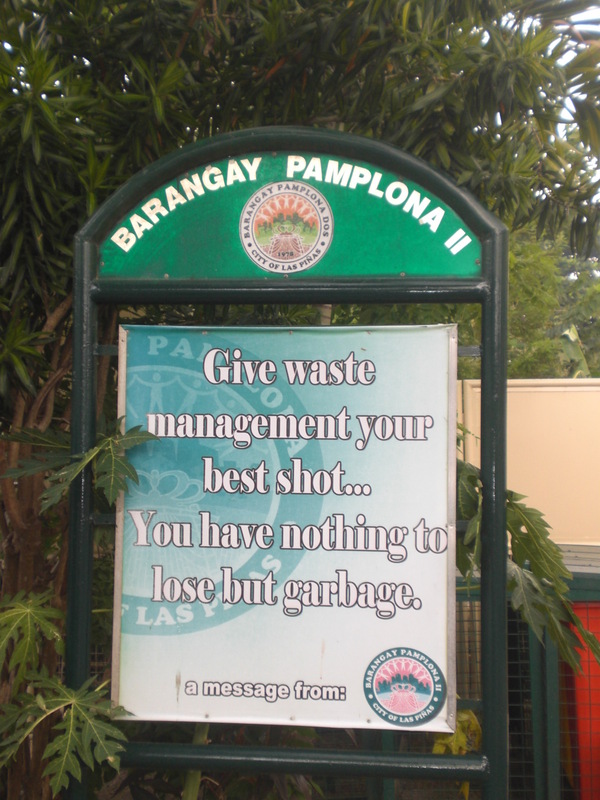 As what Barangay Captain Robert Villalon said, “Dito sa Las Pinas we use ecologically sound practices to manage our garbage. All our projects are designed to protect the environment.” From the looks of it, the residents of Las Pinas through the efforts of The Villar Foundation have indeed mastered the art of segregating sound environmental practices from those that are not thereby making Las Pinas not only a clean and green city but an Environmentally Friendly one at that too. 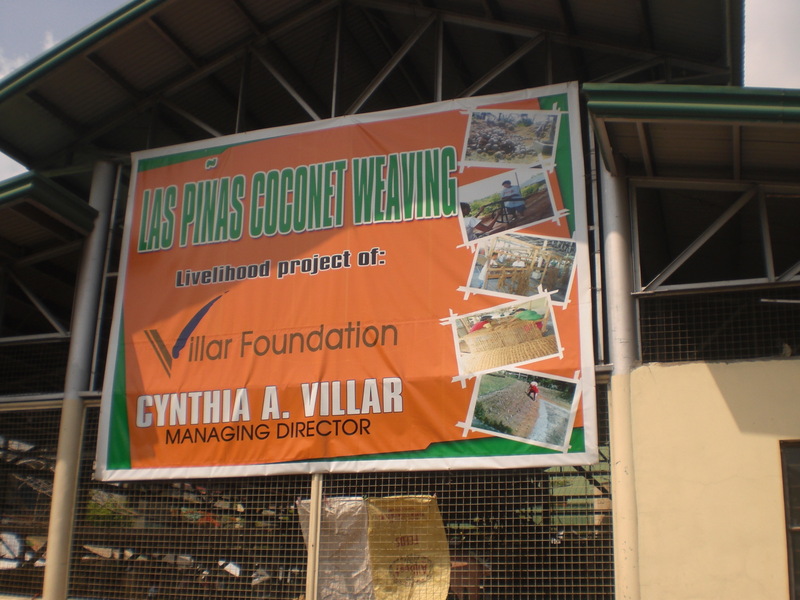 The Villar Foundation, now on its 20th year, has successfully managed to transform the community and the lives of its people by creating various interpendent social enterprises that are specifically designed to empower them to live a life of economic independence while striking a balance between successful urban development and strong ecological management. Through the sound leadership of its Managing Director, Cynthia Villar, it has indeed proven that sustainable living right in the middle of the city is possible and that sustainable development can be achieved through the concerted efforts of each individual. 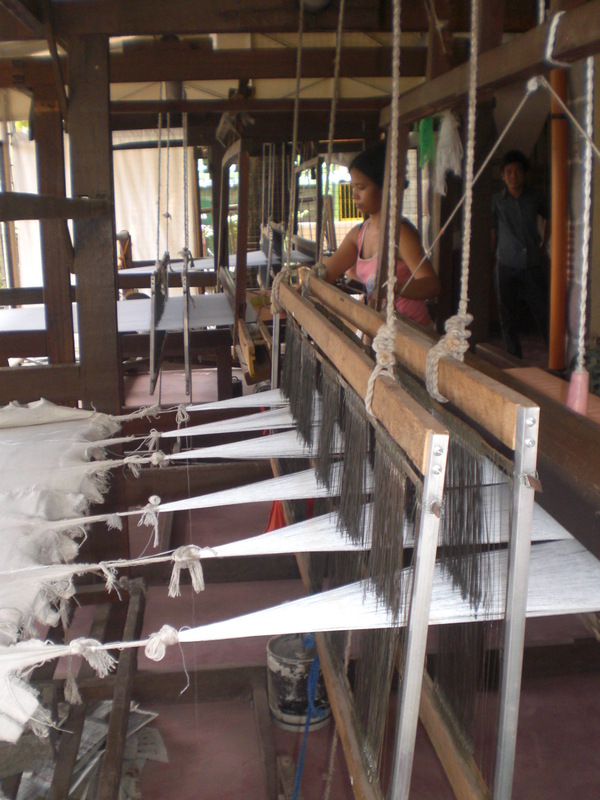 these are great livelihood programs! 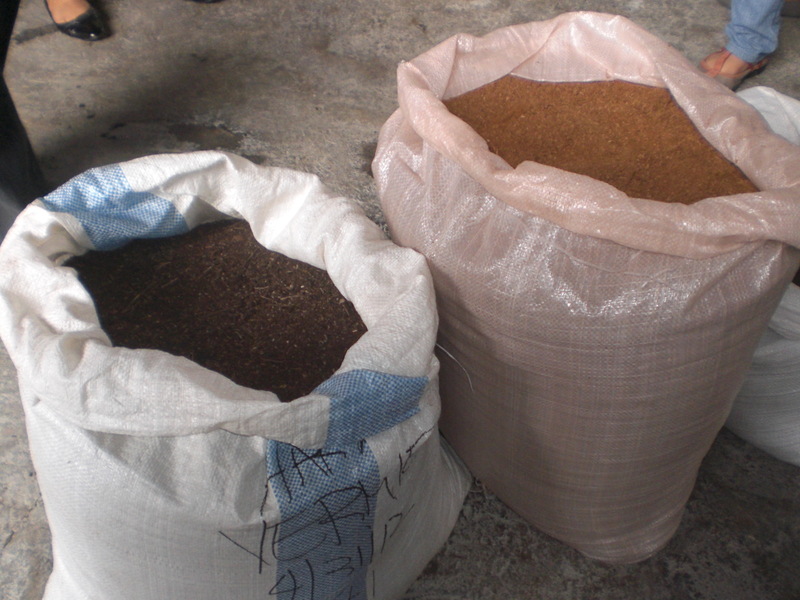 honestly it is my first time to learn about coco coir factory and amazed how the coconut husks are turned into something worthwhile! 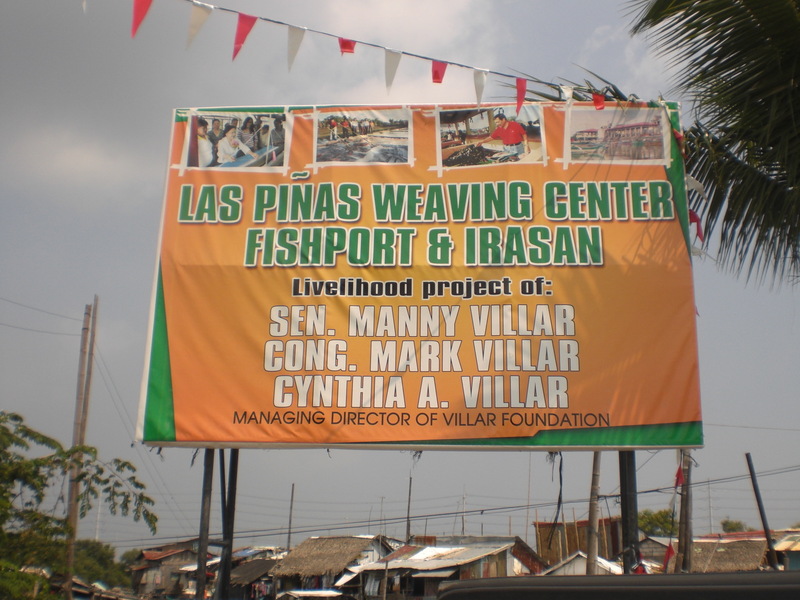 kudos to the Villar Foundation – it is a blessing to the Las Pinas residents! what’s interesting about the projects are, applicable naman pala, sana magawa ng ating gobyerno, hindi ng ilang pulitiko lang. no offense meant sa mga villars, they have done great job in promoting livelihood projects, sana lang gayahin ng ating gobyerno as a whole. saan nga b available ang mga baskets na gawa sa water lilies na yan. ang galing. how creative. 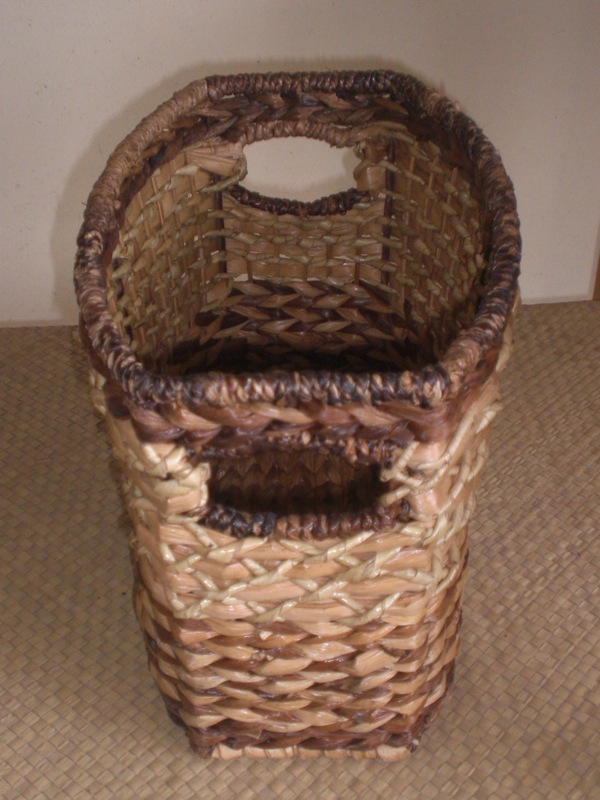 have always been fascinated by our native baskets, be it made from abaca, cooconut, or bamboo. galing ng pinoy talaga. It’s great that they were able to turn the pollutants into objects of beauty and function. I hope other cities will follow suit. Its really good to know that Villar never stopped helping and extending their hands to those less fortunates. That’s what I love about the Villar’s. Their unselfish effort to help the community, be it through livelihood projects, socio-economic ones and most especially their efforts to care for the environment. This is a good project .they help the resident earn money out of this waste. Hope they will also sell those products online. The Villar Foundation is worthy of unqualifying praise. For sure, this foundation would be helping a lot of people from employment, to business endeavor. More power! especially those coming from the masses. served and offered to many more communities. These projects has been introduced to our Barangays long time ago but what these project lacking are product endorsement and financially support. I hope our government will fully support this kind of livelihood programs not just only for their self-interest but for the development of our country. KUDOS to the VILLAR FOUNDATION. this is really a great advocacy.. So what is El Nino? Surely the storms should replenish the water supply? Why is the US going through a season of drought? The investigation begins…. Excellent value driven article here. Tons of information. Appreciate it.I actually have some fans on a facebook page related to this stuff. I’ll share your post with them and see what they have to say. I’m sure they’ll love it though. Hi, Good morning, nowadays, I hope that you will have a lot of surprises in the morning and in the morning. The Villar Foundation has indeed come a long way since its establishment in 1992 but for Mrs. Cynthia Villar, the work is far from over, she still has big dreams for Las Pinas and the Zapote River, “Pangarap ko magkaron ng sort of like River Cruise and Zapote River.